First off I have to apologize for my long absence! It’s been a crazy March so far. But I had such a craving to bake that I went out and bought a new pan just for this cake! 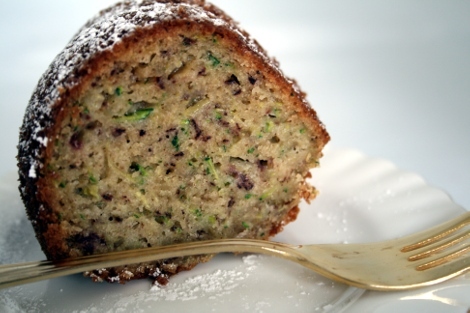 I had wanted to make zucchini bread initially, and growing up my Nonna always made the best. I had her recipe written down somewhere and couldn’t find it! So I decided to improvise and create something a little different. My mom’s been out of town this weekend, so this morning when I told my brother I was going to make zucchini bread, he asked if I could make banana bread instead. So I thought I would compromise, being the nice sister I am. I found this recipe and decided to give it a try. 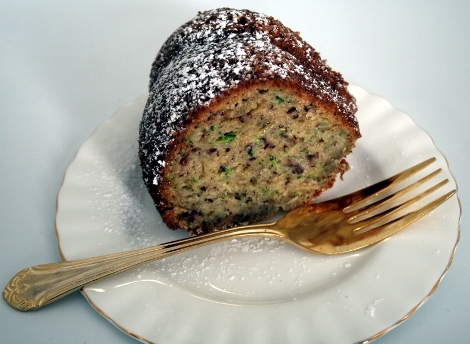 It’s super moist and I love the colors that come out of the combo of zucchini&banana. This is really yummy and I even got to use my brand new attachment! I had gotten it from Koko, back in June for my birthday and hadn’t tried it! I think I was scared, its the shredder and grater attachment for the Kitchen Aid mixer, and it’s so easy and works great!! 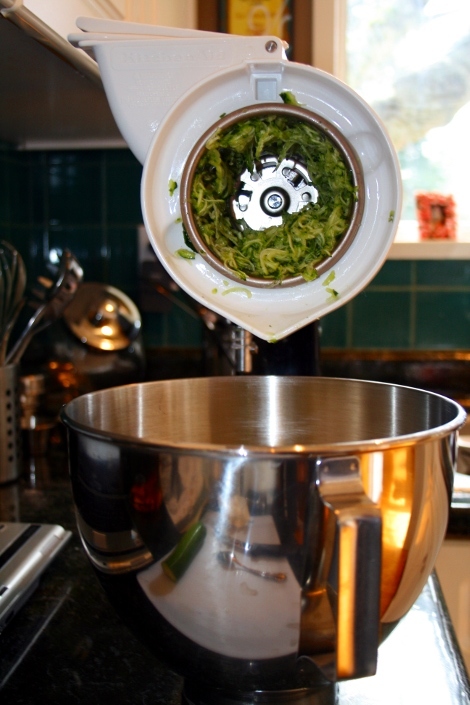 Especially for zucchini bread or carrot cake when you have to shred lots! So if you have one, try it out on this recipe! It’s delish. ps. I realize my cake is broken, or should I say “wrecked”. Needless to say one part of the cake got a wee bit stuck, but hey, perfection isn’t everything. It’s how it tastes! 1/2 cup chopped pecans, if desired. Shred zucchini and set aside. Mash bananas and set aside. In a large bowl, beat eggs, oil, and sugar. Slowly add flour, baking powder, baking soda, cinnamon, vanilla extract, and pecans. Thoroughly combine. Add zucchini and bananas until well blended. Pour into greased and flowered bundt pan, and bake for 45-55 minutes or until toothpick inserted into the center comes out clean. Cool for 10 minutes in pans on wire rack. Remove from pan and cool completely. This could also be made into loaf pans, with enough to fill about 2. Once cooled, dust with powdered sugar. Here’s a couple pics of my new gadget & bundt pan! Oooh I’m so glad your attachments worked and were helpful!!! Cool combination, too! Ooooh fantastic! It must be so moist and tender! YUM YUM YUM! TPP – It was definitely moist! and Yummy! I was so excited to see a post from you! And this looks fantastic! NAOmni – I was excited to post it!! thanks for staying in touch! I’ll be back sooner than later!! Thanks for the link to my blog. So glad you enjoyed the cake! Michelle – No problem! It was so good. Thanks for posting it! That is a neat looking cake. Love the bits of green that you see and it looks super moist! Glad the shredder attachment worked well. It must save a lot of time. Sure would be nice to have a piece of that cake for afternoon tea- Hint! Hint! Ingrid – Thanks! I liked how it turned out too with the colors! Evan – Thanks! Perhaps i’ll have to pop some over to you! 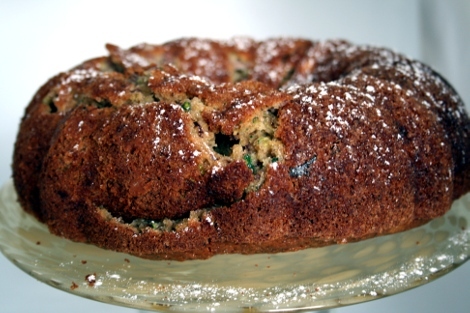 That zucchini cake looks really good! I like the green flecks in it. Wow, you’re quite the ambitious baker. Bravo!! Kevin – Thanks! I like the green too, i Love zucchini. Girl Healthy – Hahah thanks! My next one to make with the shredder is carrot cake.. i think im shredder happy! I’ve done this three times now and with equal success each time. I use frozen zuchini, defrost it and remove the water. Three cups with the water out gives one cup of zucchini. This gives such a rich texture. Great recipe to work with! Made this the other day and they went nuts over it! I am now officially my father in laws favorite! I love anything with Banana but never heard of a combo with zucchini!! Will try this recipe for sure! Thanks!